Patrick Garcia still tries to understand hispregnant girlfriend Jennylyn Mercado. Despite Jennylyn's claims about Patrick, the actor could only say,"Siguro kasi ano, you know how kapag buntis ka you're extra sensitive." Patrick Garcia dismissed rumors saying that he andgirlfriend Jennylyn Mercado, with whom he will have his first child, are alreadysplitting up. 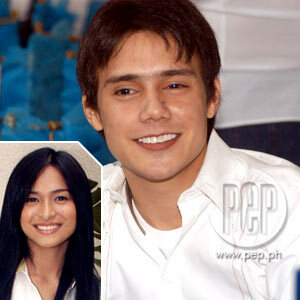 However, the young actor could not help but feeldisappointed with Jennylyn, who claimed that Patrick was snubbing her. In an exclusive interview with The Buzz, Patricksaid, "Hindi ko maintindihan kung bakit niya pa kailangan magpa-interview atumiyak sa TV pero for whatever it is, I'm still here for her, hindi ko siyainabandona." Even Patrick's mom, Bing Garcia, was surprised by theinterview of Jennylyn with Startalk aired last Saturday. She said in a separate interview, "Siyempre magugulat kamikasi walang warning, e, at saka hindi namin akalain na ganun. Kakakasama lang namin nung Sunday sa service,pagkatapos makikita namin na ganun, siyempre nakakagulat." Patrick also said it's not true that he no longer communicates with Jennylyn or that he has turned his back on his responsibilities towardsher. He explained, "For the moment, we're working things outnaman. Kumbaga lahat naman ng problemanaaayos, e."
He further added, "Siguro kasi ano, you know how kapagbuntis ka you're extra sensitive. Siguro minsan kapag isang araw hindi kami nakakapag-usap or dalawangaraw, siguro kapag galing sa argument or whatever, siguro sinasabi niyang hindina kami nagko-communicate. "Siyempre buntis ka, so marami siyang mga kahilingan. Yun ibang naibibigay ko, siyempre yung ibabe there on time, tao lang ako." PATRICK ANSWERS THE ISSUES. Aside from these claims, Patrick also clarified other issuesconcerning him and Jennylyn. First, he made a comment on the issue that he stoppedJennylyn from attending the press conference of her movie Half Blood Samurailast month. "Walang katotohanan 'yan," said Patrick. "As in that's not true, that's a lie. Neverkong ginawa 'yun. Alam naman ni Jen angkatotohanan." Then, Patrick was asked about the rumor saying that he mightnot be the father of Jennylyn's child. However, the young actor chose not to comment on the issue. He said, "Pangit naman na hindi akonaniniwala, di ba?" Another issue was that Mark Herras, former boyfriend ofJennylyn Mercado reportedly brings food for Jennylyn. Again, Patrick chose not to make a comment. Instead, he simply answered, "Well, whateverit is, let's just say na hindi ko naman napanood yun. Whether it's true or not, hindi ko pa rintinatalikuran ang responsibilities ko sa magiging baby namin." Lastly, Patrick was asked about his rumored plans to leavethe country. Patrick, surprised at how TheBuzz knew about it, answered, "Paano ninyo nalaman yun?" He then continued, "Hindi [ako aalis]. Sabi kasi ng mom ko kasi kung gumulo pa yungissue dito, they'll send me to the States first para mag-aral at magpahinga." Mommy Bing also explained, "Dati na naman yung plano, e,bago pa naman nangyari [ito]. Kasinagkaroon ng project si Patrick, so na-put on hold na naman. So, hindi na naman matutuloy." TAKING IT SLOW. When they announced the pregnancy of Jennylyn last January, thecouple went to Quezon City Regional Trial Court to consult about marriage. The couple seemed to be very determined toget married but the presiding judge advised them not to rush things. After a month, Patrick is still thinking of getting marriedwith Jennylyn. However, this time, Patrick has chosen to take things slow. He explained, "Ito ngang mga simpleng problema, e, hindinamin maayos ng kami-kami lang or kaming dalawa lang, what more kung mag-asawana kami. Tingnan muna natin. "Of course, I still love her, hindi naman mawawala yun. Hindi ko lang maintindihan yung mga ibangpinaggagagawa niya, like coming out on TV. I'm always willing to forgive naman."